If you’re after a unique bohemian experience, Sodermalm might be the place to visit. As one of the trendiest places in Stockholm, tourists will find the place an eclectic mix of retro and modern fashion that’s sure to make any bohemian spirit feel at home. Each turn at the corner might lead you to a vintage shop with rare vinyl collections or a cozy cafe. If you want to learn about fashion in Sweden, Sodermalm is its beating heart. Home to a myriad of bars, restaurants, shops, and museums, the place is a far cry from its working class origins. Södermalm used to be a housing district for workers around the turn of the 18th century. While the main streets might feature trendy spots, the side streets may give you a glimpse of the old neighborhood. Old red cottages can still be seen in the northeastern area as well as churches that date back to when the 17th century. Södermalm may have hundreds of boutiques and eateries but what sets this area apart is its majestic cliffs and amazing views of Stockholm. If you’re looking for the soul of modern Sweden, you might find it here. Södermalm is my favorite city area in Stockholm. Stockholm has a pretty good public transportation so going around the city is quite easy. From the Central Station, the easiest way to get to Sodermalm is via subway. A regular ticket (remsa) costs about 200 Swedish kronor and could take you around 10 stops. If you plan on staying a bit longer, the Stockholm Card may be a better option since it’s both a museum pass and a train card. Södermalm is a large area and most of its main streets have a nearby subway station so you may have to get off different stations depending on your stop. To be sure, you could go on the trains that head off towards Slussen and make your way around Sodermalm by foot. The streets of Katarinavägen give you another angle of the Old Town while walking towards Hornsgatan would lead you towards the commercial district where most shops and restaurants are located. 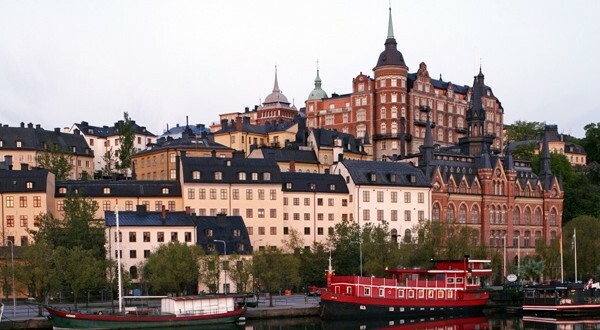 A public elevator built in 1880s, this is your best bet in seeing Stockholm in all its beauty. With just 10 kronor, you get a 38-meter ride from Slussen to Södermalm. The walk up the hill will be worth it. Moses Hill or Mosebacke features restaurants and bars with the most amazing views. Just be sure to get there a bit early since the place tends to be full on weekends. Södra Teatern has regular performances that feature Sweden’s local artists. Events may vary from concerts to theatrical plays. On a sunny day in spring, summer or autumn, this square will be full locals enjoying the sun over a glass of wine or beer after work or a coffee during the day. It is a nice place to just sit and watch people before and after you do all your fun shopping at Södermalm. Located a few meters from the Slussen station, Fotografiska Museet features international exhibitions that are sure to thrill any photography enthusiast. The museum also has a really nice coffee shop that overlooks the Baltic Sea so the views here are amazing come sunset. This eatery is one of those hole-in-the-wall types. Tucked away from the main street, this place (it’s located at Svartensgatan) serves heavenly crepes. It’s mostly a place for locals so prices are not too expensive.